ATI is in the process of making several enhancements to Galileo K-12 Online that will benefit educators, administrators, students, and parents. The most recent enhancement to Galileo the new, coming soon K-12 Student-Parent Center interface. The Center is designed to manage communications so that students and parents are provided with complete information regarding instruction and assessment used to guide instruction toward the achievement of valued educational goals. Ability for students and parents to email the teacher. User-friendly icons and graphical representations. Responsive design to accommodate use of the Center on various screen sizes. Integration of Google Translate enabling families whose primary language is not English (e.g., the family’s primary language is Spanish) to use the Center efficiently. A convenient option to choose when to integrate the new interface. 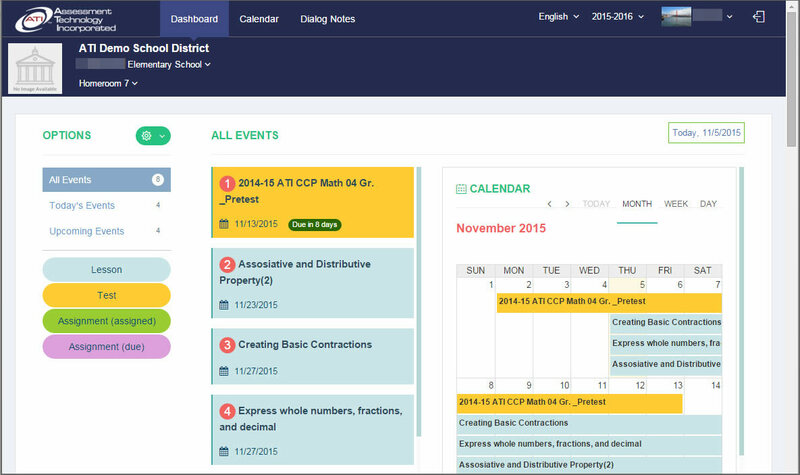 Districts and charter schools have the option to immediately switch to the new interface or to continue using the classic interface accompanied with a preview of the new interface. The Calendar Dashboard quickly provides a snap shot of scheduled assignments or assessments. Click here to see larger. Not only has the functionality of the K-12 Student-Parent Center changed but the look has, too. While districts and charters can still personalize their Student-Parent Center through the inclusion of the district/charter logo, the Center now provides each student with a page that can be personalized with photos and information. Watch for more information on the K-12 Student-Parent Center in the coming weeks. Contact our friendly and knowledgeable Field Services Coordinators to learn more.